May the 14th, 19 fished. A good turn out for today’s Wythall Royal British Legion A.C. match – and no wonder, previous years’ contests on these pools have produced some excellent sport. In fact, I’ve finished last on lake two years running with weights in excess of 80lb. An indication of the quality of fishing on offer on Hay and Barley, and across the complex as a whole. Today we welcomed new member Andy Bellingham to the club. After missing the first two matches of the season, he was raring to go. His arrival at the cafe was greeted with applause and congratulatory handshakes, as he had won the previous evening’s Eurovision Song Contest with the poignant ballad ‘Amor Pelos Dos’. In a nail biting finale, Andy managed to accumulate 758 points to seal a win he modestly described as “a victory for music”. Once again, well done Andy, and welcome to the club. As previously mentioned, these pools haven’t been a happy hunting ground for me, particularly in the previous two seasons when I drew in the low numbers on Hay pool (pegs 5 and 3 respectively). While I’m willing to concede that I got things wrong tactically on both occasions, I definitely felt that I’d been in the wrong area on the day, as the weights got progressively better as you moved towards the top end of the lake. Today I hoped for a draw somewhere in the middle of either pool. It would be unlikely I’d win the match from such an area, but equally as unlikely I’d blow-out and suffer a poor day’s fishing. At 9 a.m. I joined the back of the queue for the draw. This isn’t a position I take through superstition – I’m not one of those anglers who has to take a specific place in the queue, lift one leg in the air or close an eye when drawing a peg. Basically, I just get shoved to the back of the line because I’m small. As the anglers started to filter back with their numbered plastic disks, it became apparent that an uncanny number of them had drawn the same pegs they’d drawn last season: Pete Holtham on Hay 19; Eddie Swann on Barley 18; Trevor Faulkner on Barley 4; and finally me, on Hay 3. Bugger. As the joyous squad ran to their pegs, I crawled to mine. Weeping. Home for the day – doesn’t look so bad, does it? As the old truism goes “fish have fins”, my swim could be absolutely solid for all I knew. So at this point I gave myself a sharp slap around the chops and decided to adopt a positive outlook for the next 5 hours. When I fished this peg last Autumn I caught very well on the pellet feeder, the problem was the fish were of a small stamp on this method. I’d caught greater numbers of fish than many other anglers, but they had caught big fish down their margins. It was clear that to do well I’d need to sort out my edge fishing, hopefully snaring some of the larger specimens which arrive to feed later in the day. Bait for the day comprised of 3 pints of casters, 2 pints of dead maggots, some 2mm, 4mm and 6mm fishery (blue!) pellets and a small amount of corn. I had nothing in the way of a solid plan for my match, other than to start on the pellet feeder – usually a banker on this pool – and slowly feel my way in. I’d watch the anglers around me and try to gauge what kind of day it would be. “Big” Phil Southgate and “Bigger” Trevor Faulkner were pegged behind me on the low numbers of Barley, I’d be keeping a close eye on them as they had posted some good results from this pool in recent years. Phil and Trev: normal-sized people close up, or huge people far away? As the “all in” was called, I decided to feed a small amount of pellets onto my far bank swim. 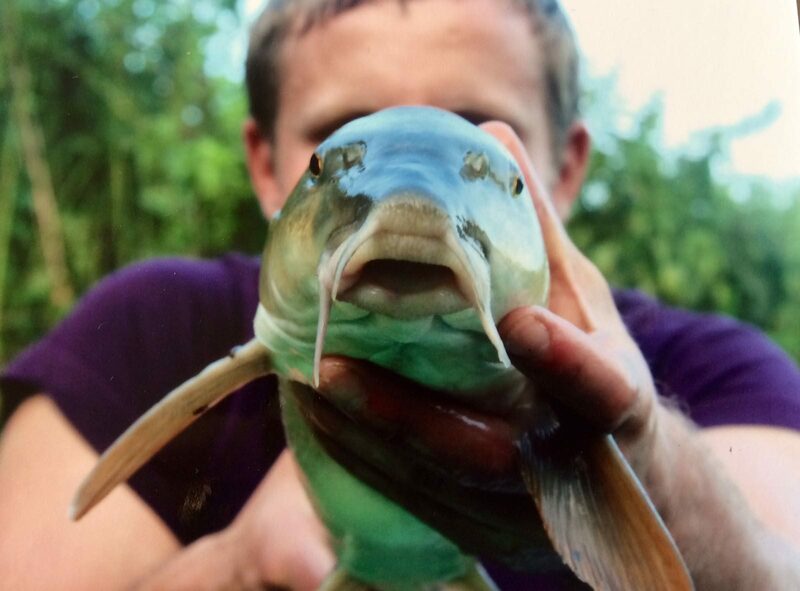 Danny Hamilton on the next peg chucked a feeder to the far bank, it entered the water with a lovely “plop”. I called “I bet you have one by the time I finish feeding”. As I shipped the pole back he shouted over “you weren’t wrong!” – fish on. And fish on for Trevor who had fooled a big old carp into taking his bait on the short pole. I threw the pellet feeder to some reeds at 25m, fully expecting the tip to go round within a minute or so, nothing. I chucked it again and still it sat motionless. On the third cast I sent the feeder slightly to the left of the reeds, in case the depth differed there, or the make up of the lake bed. A couple of minutes later the tip flew round and a carp of a couple of pounds was in the net. I fished the feeder for almost an hour, in this time I managed 3 small carp and one of the newly stocked ghost-f1s. All the while I kept the pole lines topped up. As we entered the second hour of the match I took the decision to have a look on the far bank swim, fishing a hard 6mm pellet over 4mm’s. I had a couple of small carp on this but again, it was very slow. Looking around though, it appeared to be tricky for everybody after a good start. To cut a long story short, I spent most of the remainder of the match alternating between the long edge and far bank swims. I came off these lines sporadically, to try the short pole, the mugging rig, or to slap a pellet around in the hope of antagonising a fish into feeding. None of these methods produced a single fish. As the old adage doesn’t go “fish have brains”, and today they’d definitely decided they weren’t interested. There was no rhyme or reason to feeding patterns or hook-bait choice. I fed large amounts with a big pot and tiny amounts through a cad pot. I fished bunches of maggots, triple caster, worms and corn on the hook. One choice could be met with a thumping bite almost instantly, elastic streaming out of the pole tip, when I repeated the process I watched a motionless float. So, I patiently alternated between my two edge lines, picking up single fish, or the rare run of two or three, until the final whistle. I estimated I had caught 40-45lb today. I knew that this wouldn’t be enough for a framing place. I was also aware that many had found it tough going, so I might not be on for the poor result of recent years. The weigh in started on Hay 19 and the first three anglers plonked 67lb, 63lb and 54lb on the scales (I didn’t have that much). The next two anglers weighed in 20lb and 28lb (at least I wouldn’t be last on pool). Then there was a 48lb, 75lb and another 28lb. My nets went just over 53lb, so a little more than I’d expected. Also, there was just one weight bigger than mine over on Barley pool, so I managed 6th overall and a section win. Certainly not a great result, but not the disaster I’d anticipated at the draw. Today’s Man of the Match award goes, quite unimaginatively, to match winner Tony Corbett. He drew an average peg, fished well, and won with a bit to spare. Well done mate. A cracking day today. Great weather, brilliant company and a couple of ciders on the way home. It’s not always about the fishing. Maybe if you spent less time taking photos you might catch more fish. Great Write up mate enjoyable read keep them coming.